There was a time when videogames were the exclusive purview of Japan and the United States. The industry was intrinsically linked to computer technology, and these were the nations that had it. That’s no longer true, of course. We talk about Chinese and Korean games every other day, and we can name at least five things that distinguish them from others made elsewhere. Well, I’d like to expand your horizons some ways to the West of them, to the Ukraine. There we’ll find Action Forms, a developer that released Cryostasis: Sleep of Reason, back in 2009. Cryostasis is one of those games that, while you’re playing it, you’ll go through it like you would any shooter. Your most immediate concerns, such as trying to survive the relentless enemies, trying to stave off the biting cold, and puzzling your way through the Soviet ice breaker you’re exploring will keep you distracted. It’s only when you sit back as the credits roll that you’ll have time to ask yourself “What did I just play?” This is a shooter that is closer to Half-Life than it is to Call of Duty; the story is the focal point of the game, devoting most of its resources to fleshing out the world and the narrative, rather than the gunplay. Cryostasis, as a game, well executed. It’s simple but unforgiving, which seems to be a requirement for Eastern European games. As it turns out, nothing is easy when you’re aboard the North Wind nuclear icebreaker, even when you know exactly what must be done. There’s something particularly compelling about Cryostasis as a whole, but in order to get to the core of that, I’ll go into the game’s breeding and it’s cultural context. Heady stuff, I know, but bear with me. 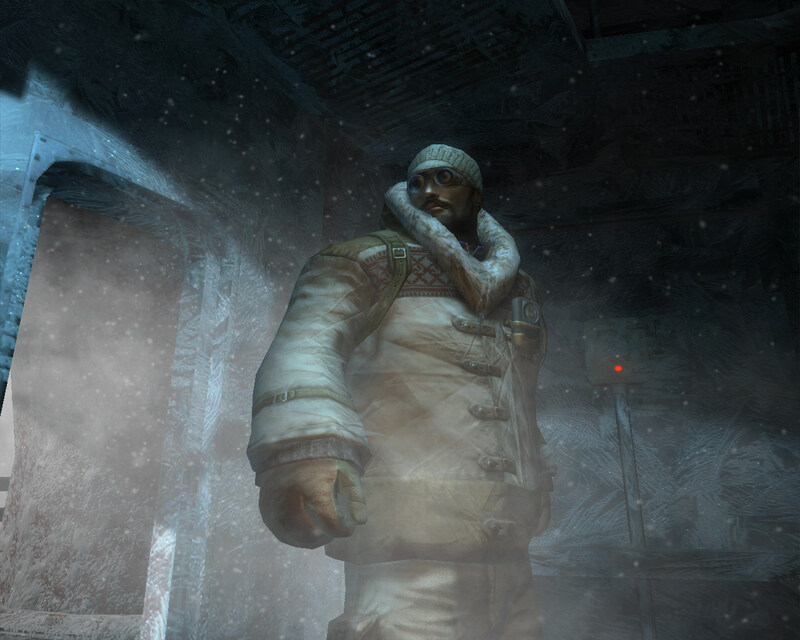 Cryostasis was part of the steady stream of games from the old Soviet bloc that started arriving to American shores for the past decade. Other examples of their work include S.T.A.L.K.E.R., which we could compare to Fallout, though set in Chernobyl, and Pathologic, which was a critically acclaimed adventure game. At the time, it was compared with Bioshock, due to its focus on storytelling and the bleak atmosphere in both games. I don’t agree with that because, while both games are brilliant, Bioshock lets the player create their own solutions to the situations they face, while Cryostasis’ problems have only one right answer. Cryostasis just isn’t trying to do what Bioshock did; its complexity is in the stories it’s trying to tell. Those stories, three by my count, are braided together through the meteorologist, Alexander Nesterov, whom the player controls. There’s the fairytale of a tribe of people trying to make their way through a dark and noxious forest, the story of the North Wind, its captain and his crew, and Alexander’s own story as he tries to survive the frozen wasteland the ship has become, not unlike the chill the East coast of the United States as I’m writing this. Those stories are not the usual videogame fare, as far as stories go; they’re far more primal, unrelenting like the game itself, and they reflect a cultural perspective not often seen in Western videogames. That cultural perspective shines through in the other titles I mentioned above, but with Cryostasis’ emphasis on storytelling, coupled with the narrative devices of the FPS genre, really puts it in contrast. These are stories where the individual is meaningless. As you go reliving the last moments of the North Wind’s crewmembers, as you delve into the ship’s secrets, the point that’s made over and other is that the metal is more important than the flesh. These aren’t stories about a heroic individual facing adversity and overcoming it; these are stories about heroic individuals sacrificing themselves to allow the ship, the tribe, to overcome. Bioshock, on the other hand, is a story about a single man overcoming every challenge he comes across, even his own enslavement. In Cryostasis, the point is made that the slaves stay just that, slaves; survival isn’t a matter of choice. So, why is this important? Well, if I can convince you to give Cryostasis a look, and I hope you do, you’ll experience a wholly different culture (provided you’re not Ukranian, of course). In short, if you play Cryostasis: Sleep of Reason, you’ll pretty much have the same experience as a cultural exchange student, without as much as walking out your front door. That isn’t true about most videogames, but it is true for Cryostasis. In fact, it might not be true for most movies, books, or music. A videogame pulling this off is nothing short of miraculous, and Cryostasis does just that. The fact that we live in a day and age where an experience like Cryostasis is there for anyone to have is one of the great things about the digital era. Another great thing about it is the fact that you can hop on over to Steam and buy a digital copy of Cryostasis. Go ahead, it’s a snow day.